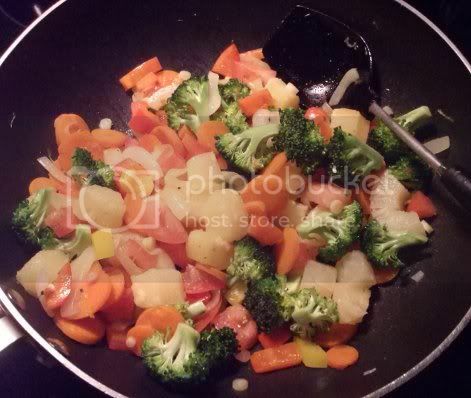 This is a stir fry absolutely chock full of colorful veggies. The flavor is slightly spicy and a bit tangy and makes me wonder why I don’t cook it all the time. Kind of funny, because I did used to make this quite a bit when I cooked more stuff out of Vegan Express. Back when my vegan cookbook collection was in its infancy, that and Vegan Planet were pretty much my go-to books for everything. I’ve let Vegan Express languish on the shelves lately, which is a pity because it has quite a few tasty recipes, including this Thai pineapple rice stir fry with a mild coconut curry sauce. I don’t really agree that it’s “fried rice” as the name suggests, since it’s made with warm rice instead of cold and the addition of coconut milk keeps it from getting the firm texture that I associate with Chinese fried rice. It is, however, quite delicious. And, of course, pineapple chunks for the final fruity zip. 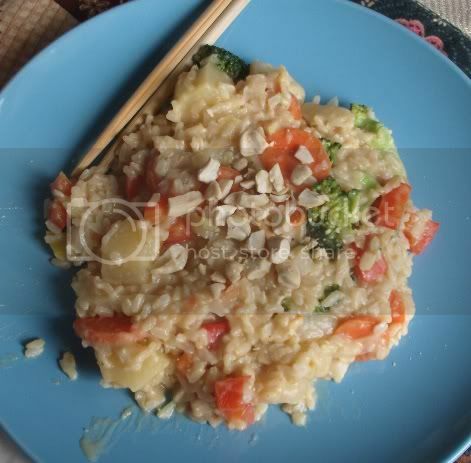 I made it with brown rice, but any long-grain rice would do…I think basmati would be particularly tasty. Raw cashews make a good garnish. This is a rather astronomical amount of food when it’s all mixed together. The recipe says it serves six, though by my count it’s closer to five. I suppose it depends on whether or not you want to serve something with it. 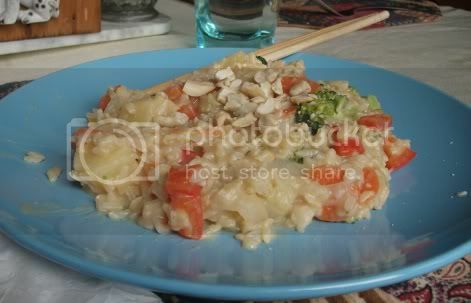 My mom, brother, and I ate it as is with a few cashews sprinkled on top, and that was enough! It’s a great recipe to make when various veggies are in season, or whenever you can get a whole bunch of them on sale. And the curry powder/pineapple combination isn’t one you find in a whole lot of places. It’s just unusual enough to make a good change of pace when you’re ready for something new!